This effect is based on Ted Anneman's Volition. I always liked the concept of the effect, but I didn't care for the original methodology, so after a great deal of thought here is what 1 came up with. As you will see, playing cards are not the only items that could be used, but also signed cards, or small objects etc. could substitute for them. Effect: Four spectators are invited to assist in an experiment. 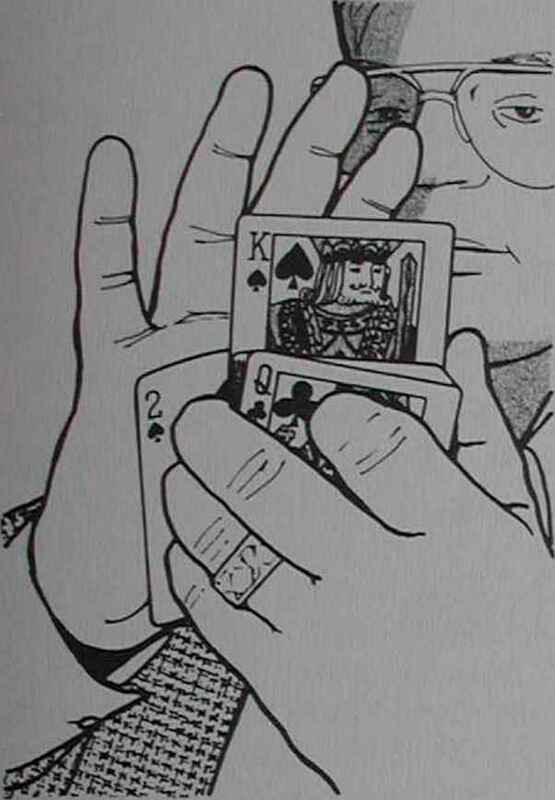 Each of of the assistants is handed an envelope and is asked to freely select any card from a normal deck of cards. They are to remember what card they had picked and seal it in their envelope. One of the assistants is then to collect all four of the envelopes, mixing them up so that their order won't be known to anyone. Holding the envelopes in a stack, the performer picks up a pencil and states he will now number the envelopes from one to four. Throwing the pencil back on the table, the performer asks spectator number one, which digit from one to four flashes into his mind. Whatever number he chooses, the envelope with that digit printed on it is given to him to hold on to. The performer then asks the second assistant which of the three remaining digits from one to four would he prefer. Again, the performer hands the envelope with the chosen number to the assistant to hold on to. The third assistant is asked which of the two remaining digits he would prefer. The envelope with his chosen number is handed to him and the remaining envelope is then handed to the remaining assistant. Each person is asked if everything has been fair, and whether or not he, or she. had a free choice, first of the cards, then of the numbers. Each answer yes, yet upon opening their envelopes, each spectator sees that he had named the one and only number that would give him back the exact card that he had freely chosen! Method: Mark four pay envelopes ala Psuedo Psychometry. that is each i tin envelopes having a mark on it so that they may be handed out in i . (>•■- itic oider, allowing the performer to identify which envelopes hcli nig to which spectator. The only other things needed are minimal .ilxlity with a thumb writer and a touch of acting ablility also. Win u you receive the envelopes, pick up the pencil, but only pretend 10 number the envelopes. In reality they stay blank until your thumb writer n<ies to work later on. When done, openly throw the pencil back '•n I he table so there can be no thought of you using it. \ quick glance at the envelope on top of the stack will tell you which "i the spectators that it belongs to. Casually ask that assistant which »lumber from one to four does he prefer. Whatever the answer, you thumb write the number on the envelope. You then pretend to look liu the properly numbered envelope and then hand it to that specta-tin I do this by pretending the correct envelope is in the center of the itack but in just slipping off the top envelope, it's really impossible to lull cxactly where it is coming from. Sntice the marking on the next top envelope and ask that person which • I the remaining digits does he prefer. Just follow the same procedure it before, thumb writing in his number and then "looking for it" in in the stack. Of course, when the third spectator names his choice, you no able to thumb write the last two digits almost at once. Ilavo each person open liis envelope .Theyali have received back the cxact card that they had picked at the start.